“How do I write the great book that’s inside me, dying to get out?” This is a question that Monica Bhide has been asked thousands of times when speaking everywhere from the Smithsonian to leading blogging conferences to Les Dames d’Escoffier, from London to Dubai to Washington, DC. There’s no boilerplate or blueprint for being a successful creative artist. But Monica, through her decade of writing and teaching, has formulated easy-to-follow principles to help you unleash your creativity, whether it be writing a book, painting a canvas, or composing a musical opus. Read. Write. Reflect. will show you how to face your fears, shoot down your demons, get yourself started, and follow through with persistence until you complete your creative project. Be still. Believe. Persevere. Monica uses stories and anecdotes as reflecting ponds to elucidate these basic actions that will set you on YOUR path to creativity. She guides you to the place where YOU make the commitment to apply these ideas daily to get your work out into the world. Read. Write. Reflect. is a guide to, in Monica’s words, “being led by your dreams, not your demons.” You can’t wait for inspiration. Don’t hang around expecting your muse to show up. Don’t sit and hope for someone to discover you. Use the tools in this book to understand yourself and your motivations, to reflect, and then work and persevere to become a creative artist who produces art that is straight from the heart. In Read. Write. Reflect., Monica Bhide’s gentle, lyrical voice guides you to a more inspired level of creativity. I recommend this encouraging guide for any creative soul that needs constant or occasional nurturing. To know Monica Bhide is to be inspired. She is a thought leader not only in the culinary world, but for those seeking a deeper connection with their passion and their purpose. Through this lovely collection of essays and prompts, Monica will light the kindest of fires under anyone – artist, scientist, wanderer – while creating a safe space to be more intentional. I highly recommend reading, savoring and putting the wisdom within to use! Read. Write. Reflect. is the perfect blend of creative inspiration and pragmatic action. It breaks past the fears that hamper most writers, empowering you to find a renewed sense of clarity and purpose in your writing. If you feel stuck in your writing, Read. Write. Reflect. will help you get unstuck. Read. Write. Reflect. 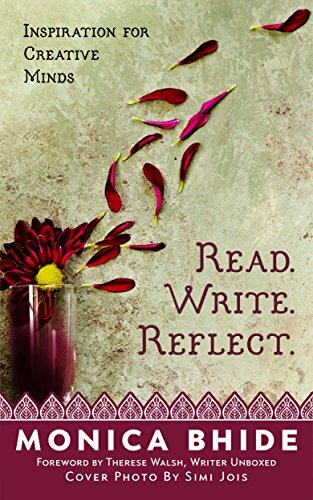 is a refreshing insight into the writing process, and it is a process. Monica brings a truly reflective lens to the work of being a creative. It’s like having a very wise voice in your ear, asking you the questions that keep you moving forward, even when the going gets tough. It should be on your must-read list. I define ‘success’ as having your life on your terms. And the single most valuable success lesson that I continue to learn, grow and literally profit from is SLOWING DOWN. In the instruction manual Monica includes in this masterpiece, she reminds us of the need to do precisely that – slow down enough to be present with what is, so that we can work creatively and masterfully with that. I just love the short, poignant stories and the collection of suggested listening and reading references are as impressive as it gets. Thank you, Monica Bhide, sincerely, for slowing down enough to make the time to create this collection, this creativity workbook. I will use it as a daily source of inspiration. Aspiring writers, or artists of any stripe, would do well to heed the excellent advice in Monica Bhide’s Read. Write. Reflect. If nothing else, the concept of ‘Timeboxed Whining’ will stay with me for life! Like a Tiffany diamond, Monica Bhide’s Read. Write. Reflect. has many facets – each brilliant and each complements the other to create a joyous mental illumination. Giving advice is the easiest thing to do but it takes genius to do it in a way that is motivating, energizing and inspiring. From writing food recipes the author has created a gem of a recipe for success and a blueprint for living a life that you can be proud of. To be honest, this is very hard work but the bitter pills have been made palatable, even delicious, through her unique charm, wit and humor. You can read the nuggets of wisdom in Read. Write. Reflect. and be entertained or you can take them to heart, put them into practice and transform yourself and your life. The ball or the book is in your court now!